This is an easy, yet healthy dish, filled with lots of flavor. Homemade Falafel topped with tomatoes, cucumbers, purple onions, greek plain yogurt, dash of salt, pepper, dill and paprika with olive oil is all you need. Pita bread and greek olive hummus compliments the side. It’s a great combination of a platter. For leftovers the nest day all you have to do is open up the Pita bread and add everything in there with some lettuce. 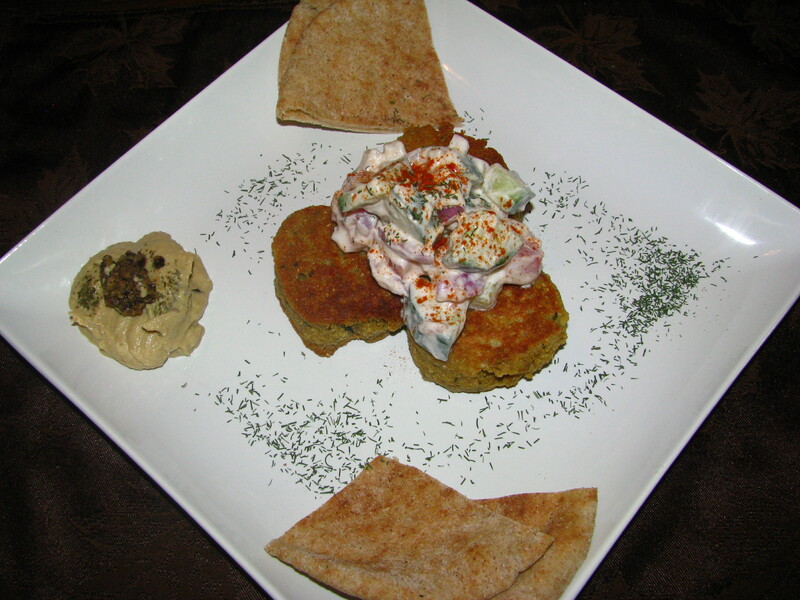 Falafel is a deep fried ball or patty made from ground chick peas and/or fava beans. Falafel is usually served in a pita, which acts as a pocket, or wrapped in a flatbread known as lafa. The falafel balls are topped with salads, pickled vegetables, hot sauce, and drizzled with tahini based beans. Falafel balls may also be eaten alone as a snack or served as part of a meze. Falafels are brilliant! I’ve only ever had one, but it was so filling – I didn’t need to eat for about 12 hours afterwards! By the way, as a follower of my blog, I’d like to invite you to my first-ever linky party on Wednesday 11th April at 4pm. The theme is High Tea and I’d love to see any posts you have that fit in with this idea. It could be cupcakes you’ve made, your favourite teacups, paintings, what you’d wear to a tea party, a tea-party tutorial, recipes, photographs – anything goes, as long as it’s on a teatime foodie theme! The party’s on until Friday 13th at 4pm, so you have plenty of time to find your favourite posts. The linky party will be a bi-weekly affair so hopefully I’ll see you at one or two of them. Have a great day!